"Day", "Day[J]", "StriderDoom", "SleepingDrone", "Correct"
Sean Saintmichael Plott (born June 27, 1986), better known as Day, is an American eSports commentator, player, event host, and game designer. Plott is best known for his contributions in the professional StarCraft scene, where he regularly appeared first as a player and later as a commentator and host at various tournaments for the game for many years. More recently, Plott has branched out to other competitive games, such as Magic: The Gathering, Hearthstone, and Dota 2. For the latter, Plott co-hosted The International 2017, the game's premier tournament. Plott has also worked as a game designer at a company called Artillery. Plott grew up in Leawood, Kansas, was raised Catholic and attended Rockhurst High School. During this time, he and his brother Nicolas "Tasteless" Plott began playing StarCraft: Brood War. After graduating high school, he attended Harvey Mudd College in Claremont, California, where he graduated with an undergraduate degree in mathematics. After college, Sean attended the University of Southern California in Los Angeles earning a Master of Fine Arts in interactive media in May 2011. Plott was an avid player in the western StarCraft scene, participating in many tournaments around the U.S. playing as Zerg. Plott's first major results came in 2004 when he was able to take 12th place in the World Cyber Games (WCG) USA tournament. Plott then went on to represent the U.S. at the WCG Grand Finals where he finished in the top 200. Plott later placed 1st at the WCG USA tournament in 2005 and 2nd in 2006. Sean started casting with brood war reviews. With the release of StarCraft II he moved away from competitive playing of his own and focussed on full time streaming. He regularly casted for the Major League Gaming Pro Circuit, the seasonal DreamHack LAN, the Intel Extreme Masters' Cup, the North American Star League and other tournaments. In addition, Plott was one of the stars of "State of the Game", where he discussed current events within the StarCraft community along with other highly regarded members of the community, including the show's caster J.P. "itmeJP" McDaniel. Plott has not played StarCraft II professionally since 2010's HDH Invitational. He was a primary caster of the BlizzCon 2011 tournament, beginning at the regional invitational qualifiers and ending at the finals, hosted at BlizzCon 2011. He has also cast a number of tournaments he himself co-organized, including the After Hours Gaming League  and the SC2 beta tournament, King of the Beta. 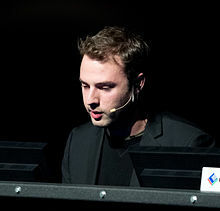 In 2012, Plott appeared as a caster for the Red Bull LAN and MLG's Winter Championship. In May 2013, Plott competed in a Magic: the Gathering Pro Tour as a wild card selection. The same year, he began producing a YouTube series regarding the game called "Spellslingers". In each episode, guests such as Felicia Day and Grant Imahara take on Plott with the hope of emerging victorious in an all-or-nothing match, while teaching the audience the tips and tricks to become better at the game. "Spellslingers" recently released the final episode of its 5th season. In January 2017, Plott began a weekly series in which Dota 2 personality Kevin "Purge" Godec teaches him advanced gameplay concepts of the title. In August of the same year, he served as the co-host for the premier Dota 2 tournament, The International 2017. In September 2013, Plott joined a new game company known as Artillery. At the company, Plott worked on the real-time strategy game Guardians of Atlas, which opened to beta testing 2016. In August 2016, Plott announced that he had left the company to pursue other ventures. ^ Sean Plott (19 April 2016). Day HearthStone Decktacular #211 - Moar Fatigue Mage! P2. YouTube. Event occurs at 9:20. Retrieved 20 April 2016. ^ Sean Plott (27 April 2016). Day HearthStone Decktacular #213 - WOTOG Pack opening Extravaganza! P1. YouTube. Event occurs at 14:26. Retrieved 26 April 2016. ^ Gaudiosi, John (July 6, 2013). "Sean Day9 Plott Explains What It Takes To Be A StarCraft II Pro Gamer". GameSkinny. Retrieved June 29, 2015. ^ Sean Plott (8 June 2016). Day Story Time: A Frisbee Story. YouTube. Event occurs at 8:32. Retrieved 19 June 2016. ^ Sean Plott (11 July 2018). Day vs. Steve Agee ǀ Magic: The Gathering: Spellslingers ǀ Season 4, Episode 4. YouTube. Event occurs at 12:25. Retrieved 11 July 2018. ^ a b "About Day9TV". Retrieved March 19, 2012. ^ "WCG 2004 Single Elimination Results". Archived from the original on April 21, 2012. Retrieved April 5, 2013. ^ "Starcraft Results - WCG 2005". September 7, 2005. Archived from the original on September 28, 2010. Retrieved April 5, 2013. ^ "WCG USA National Championship 2006 (Starcraft: Brood War)". Retrieved April 5, 2013. ^ Esanu, Andreea (17 December 2016). "Day starts his apprenticeship in Dota 2". GosuGamers. Retrieved 24 August 2017. ^ "The International Approaches". blog.dota2.com. Retrieved 22 July 2017. ^ Gera, Emily (September 6, 2013). "StarCraft champion hired to work on new browser game". Polygon. Retrieved August 27, 2016. ^ Plott, Sean (August 11, 2016). "Last week I left Artillery Games to be Day full time! In the coming weeks, I'll likely have new show announcements en route!". Twitter. Retrieved August 27, 2016.